With today’s economy, you would think that luxury cars are a thing of the past. You may also think that luxury cars should be left up to the experts at Rolls Royce or Bentley. However, these two companies changing minds and turning heads with the all new 2018 Chevrolet Malibu and the 2018 Buick Regal. To discover why the Malibu is a top choice for affordable luxury, drop in to Mike Anderson in Hobart, IN. You will not be disappointed with the exceptional customer service and the amount of options that you will find at Mike Anderson’s dealership and service center in Hobart, IN. Come on by today to see our unbeatable prices and new/used stock. There is something for everyone. The new 2018 Buick Regal creates a new drive and performance in 2018. It has an intelligent drive system and a 2.0 turbocharged engine that comes standard on every model. With three different models to choose from, each one better than the other, the Regal brings heavy competition to the table. The sporty look is not just a facade, the drive performance matches its looks its active clutch and grippy wheels. The 2.0 turbocharged engine has about 250 horsepower and gets mpg of 22 in city and 32 on the highway. Malibu: 49 mpg in the town for a hybrid model. If all-wheel drive is not your style, the 2018 Buick Regal also comes in front wheel drive. However, with three models available, is it worth the price? The Chevrolet Malibu is the perfect mid size car if you have green initiatives and saving some money on gas. 2018 is a might strong hybrid that will not let you down. With its 1.8L hybrid engine and average 49 miles to the gallon, in the city, you will never want to drive anything else. The Malibu keeps you and your fuel consumption in line with the driver efficiency gauge which gives you feedback so you can save more. Other driving performances and features include a standard 1.5L Ecotec turbo or an upgraded 2.0L eco line turbo, each with impressive horsepower and fuel consumption. The Buick and the Malibu are both incredibly impressive cars with top of the line driving features and driving performance technology, but not all vehicles are built with the strength and durability that should be considered when looking at new cars. Chevrolet is known for sturdy, long-lasting trucks, cars and SUVs. They are simple and easy to fix. Even with high mileage, the 2018 Chevrolet Malibu will keep you rolling in style and luxury for years to come with little to no complications. Unlike the sleek, stylish design of the exterior of the 2018 Buick Regal, the inside is much more sporty and busy. The infotainment system can be used for both android and apple products. But with a more complicated way of going about using it and like the Malibu, it also has an option for 4G LTE and Onstar. The inside may look nice, and the technology may be top of the line. However, the interior is a little cramped. With less leg room and height in the rear compared to the Malibu, the Regal is more suited to a smaller person. The 2018 Chevrolet Malibu is not only a top of the line hybrid vehicle, but it also comes with MyLink infotainment system which is compatible with both Apple and Android phones. 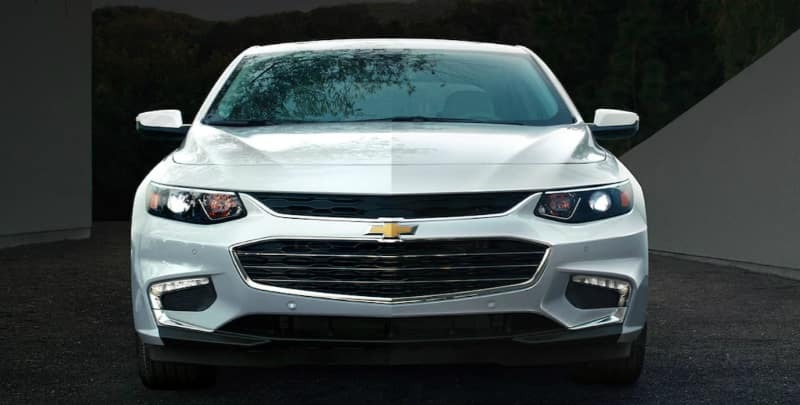 The Malibu also has the option to activate the myChevrolet mobile app which will keep you up to date on the health of your car, lock and unlock your doors as well as start your engine from a distance. As for the interior, there is nothing that will disappoint. Designed with luxury in mind, the 2018 Malibu is spacious and quiet. It is designed to take you places in the utmost comfort. With a simple, non-cluttered dashboard and steering wheel added controls, there is no need to take your eyes off the road. Your passengers will ride in comfort in the front or real with ample leg room and head space. The Malibu has excellent trunk space, so there is no need to worry about running out of space for your stuff. The Buick goes over the top in safety. With lane change and side blind zone, the Buick keeps your riding in style and safety. With smart safety features like forwarding automatic breaking, the vehicle’s computer system can detect a possible oncoming collision and slow down for you. It may not stop the collection from happening altogether; however, it will make it less severe. Available OnStar will keep you even safer, and they are there when you need it the most. The Malibu has top of the line safety feature add-ons that are worth the extra money. With Front/rear park assist, pedestrian braking, adaptive cruise control, you can’t go wrong. The Malibu also comes standard with a comprehensive airbag system and high strength roll cage; this vehicle is ready for those unforeseen moments while on the road. Both of these Luxury Midsize sedans are beautiful inside and out. They both have fantastic safety features and top of the line infotainment system. Starting at $21,680, the all-new 2018 Chevrolet Malibu is a better value for the luxury car you are looking for. Not only is it a hybrid vehicle, but it also has a better interior, exterior and all around systems. The Buick starts at $25,915 . It may have a flashier exterior and a better ride, but the amount of money you would be spending on gas and the cramped interior make it a less attractive option. Sometimes, cheaper is better, and in the case of the Malibu, that statement stands true.